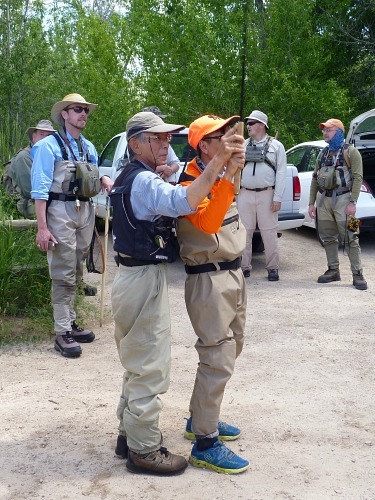 The Oni School - 2015, put on by the Tenkara Guides in Salt Lake City, was a three-day event that provided excellent instruction, unequaled camaraderie and awesome views. I refer to the event as Oni School - 2015 because I believe there will be more in coming years. All the reviews I've read have been very positive. Salt Lake City is almost a 5 hour flight from New York. How do you pass the time? Tie flies, of course. Mitten clamps, nippers, a little thread, some feathers. What more do you need? A little coffee beforehand and a coffee cup waste basket, and that's about it. All the flies I used for the entire three-day Oni school were tied on the flight on the way out. 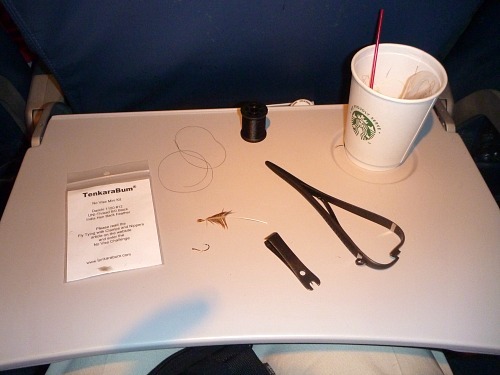 My first stop after flying into a new fishing location is usually either Home Depot or Lowe's to buy materials to make a wading staff. John Vetterli had done me one better and had bought enough rake handles to make 20 staffs! With the staffs taken care of, the first order of business was to go fishing! 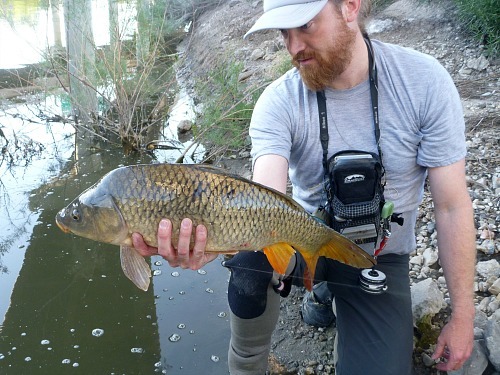 ERiK Ostrander agreed to take me to their secret carp spot, as long as I agreed to not tell where it is. All I'll say is he really does carry a ladder in his truck so he can climb over the fence. ERiK caught two. I hooked two but was unable to get either one into the net. When ERiK and Rob talk about how to land big fish on fixed line rods, they speak from experience. Strategy and tactics. You can't just hold the rod in the air and expect to land fish of this size. The initial target for the Oni School was 20 students and I believe the final number was indeed 20, although some participants were only able to attend for one or two of the three days. Also, (and I found this a bit surprising) at every opportunity a lot of participants headed off to fish rather than stay with Oni (as we were told to call Masami Sakakibara). As it turned out, there were lots of opportunities over the course of the weekend to observe Tenkara no Oni's style of casting and fishing. 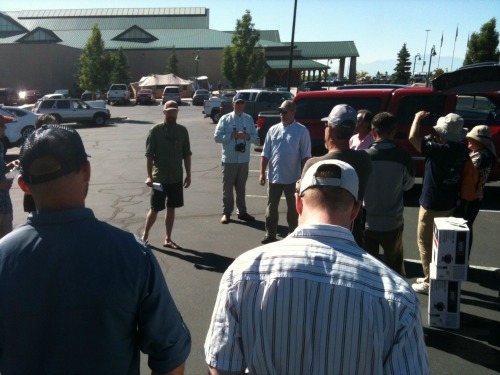 The initial meeting was at a Cabela's parking lot, giving people who had not purchased fishing licenses in advance a chance to buy them before we hit the river. 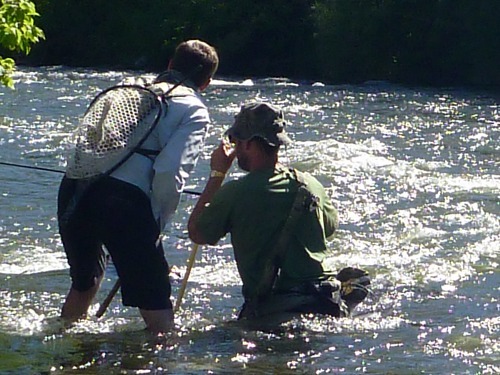 The Tenkara Guides' stated business plan of "there is no plan" was not in evidence here, there was definitely a plan to make sure we were all legal. Once we carpooled from the Cabela's parking lot to the venue and reassembled, the Oni School began with a casting demonstration. People were then urged to come up and get some one-on-one coaching to improve their casting form. Unfortunately, I did not get a good photo of the initial one-on-one instruction. However, informal hands-on sessions occurred throughout the long weekend. Here, Luong Tam benefits from the master's hand on the final day. I must say, the short time it took for Masami Sakakibara to hold the rod with you and cast, again and again, until you "got it" was itself worth the cost of the school, the hotel and the airfare. More on that later. After the initial casting demonstration and one-on-one casting workshop, we all broke up to do some fishing. My flying tie seemed to work. I didn't catch a lot of fish, and I didn't catch big fish, but I did catch fish. Although the word "oni" in Tenkara no Oni is generally translated as "demon," that is misleading, particularly if one thinks of demons in the Christian sense of evil spirits to be exorcised. There is no English word that really captures the various meanings of oni, but in this context, it means someone who is intensely focused, extremely disciplined and extensively trained - almost closer to a Spartan than what we think of as a demon. Sakakibara sensei is all that, but not all the time. 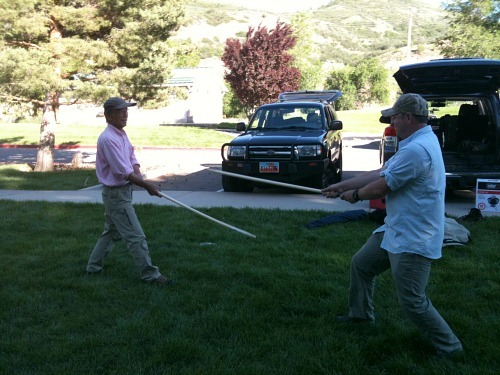 After lunch on the first day he accepted John Vetterli's impromptu wading staff kendo challenge. He is also a humble man. After catching a hoped-for Bonneville Cutthroat, there was no fist pumping, no rod in the teeth hero shot, not even much of a smile. Just a man who has absolutely no need to boast. On the afternoon of the first day, I spent most of the time just watching Oni fish rather than fishing myself. 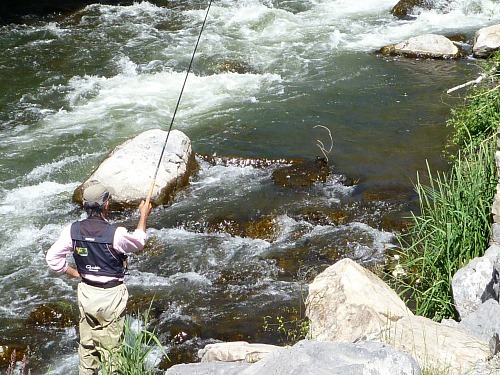 Here he is fishing a large bank eddy. The photo was snapped only a moment before he caught a fish just about where his line is now (very, very faint pink line angling down into the lower right hand quadrant of the eddy). 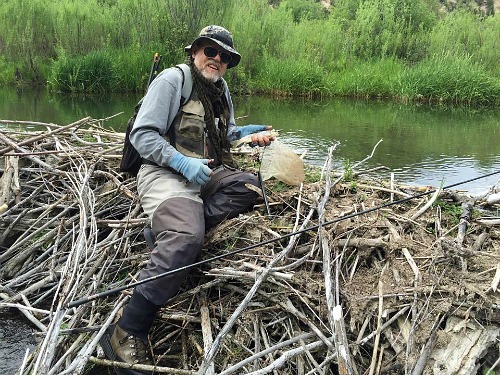 He caught a couple other fish, targeting the slower water in a rushing river. 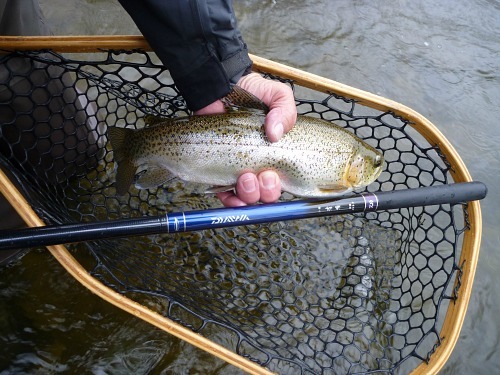 He does not fish weighted flies so fishing the faster sections would be fruitless. The morning of the second day started with Oni fishing a plunge pool. From my vantage point high on the opposite bank I could see numerous fish in the pool, all tucked right on the bottom. I could also see Oni's fly drifting over their heads. 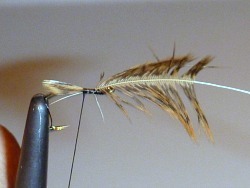 The common refrain by tenkara anglers that a plunge pool will allow you to sink your fly to the fish. Sometimes it works and sometimes it doesn't. If the plunge pool is caused by a logs and branches, as it was here, casting above the pool is likely to result in a snagged fly, not a fly drifting along the bottom of the pool. Oni's style of tenkara is to use only unweighted flies - even in a situation where a bead head would have gotten down to the fish and may have caught some. 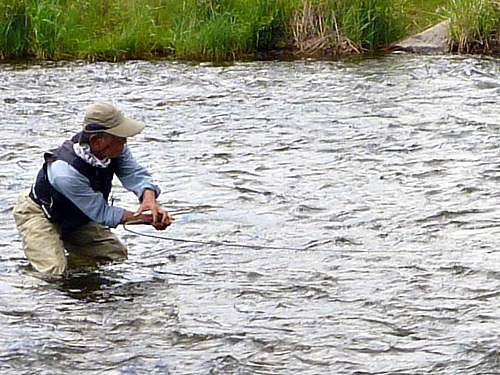 Not catching every fish in the river - even if you can see them and even if another method might have caught them - is something you have to accept if you are going to adopt the Oni style of tenkara. Oni's cutthroat shown above was caught just a little ways upstream from the last bend visible in the photo directly above. I guess the point is that with the Oni style, you will catch fish, and on balance perhaps more fish than if you used a less disciplined style, but there will be fish you can't get down to and can't catch. Oni's skill does show, though. A little further upstream, above where he caught the cutthroat, a group of at least 10 of us had followed him up - some wading to get a better vantage point. 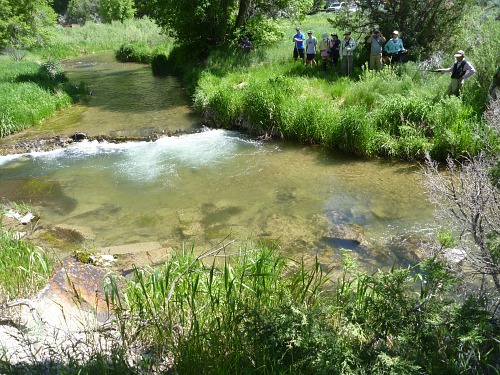 After some students pushed onward to fish on their own, he cycled back downstream behind the crowd a bit and in one or possibly two casts caught a fish in a pocket midstream. 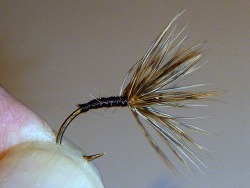 There is a lot more to the Oni style of tenkara than making long casts with light lines. Reading the water, not just to figure out where the fish are likely to be but also to figure out how to present your fly to get the optimal drift the first time is more important that how far you can cast. 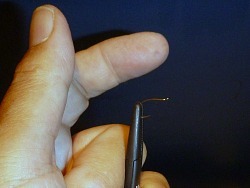 Long casts that result in poor presentations do not catch fish. Lunch the second day was chicken fajitas, with a little fish for those who wanted some. A few people who never keep fish commented on how delicious it was. 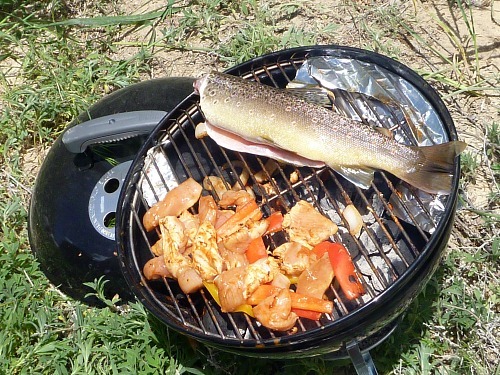 Fresh trout over the coals is a treat. A rare treat, perhaps, but a treat nonetheless. After lunch we all split up to fish the stream. Luong Tam, Frank Nadell and I headed quite a ways upstream and came upon a nice beaver pond. Most of the fish in the pond weren't big but they were hungry. Frank saw one huge fish but couldn't tempt it to take anything. 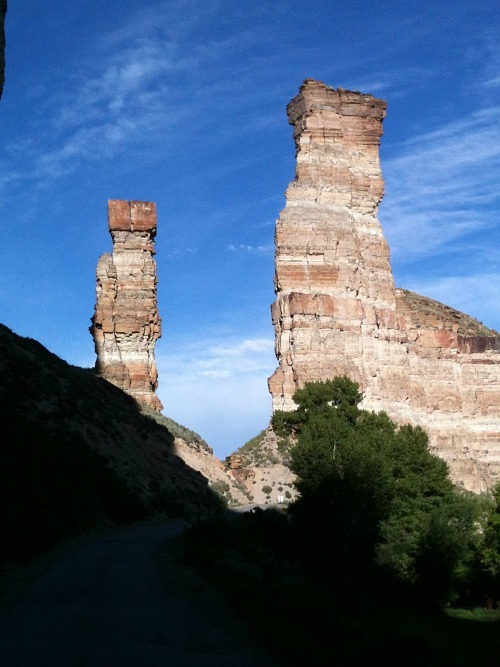 On the way back out of the canyon after the second day's fishing we were treated to some outstanding scenery. 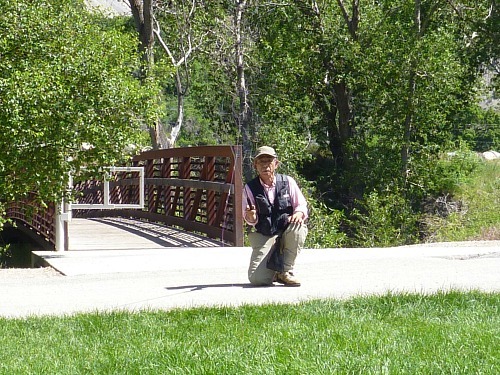 The Tenkara Guides' "No Plan" plan was in evidence as we were trying to meet up for the third day. It took a while to round everyone up, as there were several possible meeting spots that matched the description we were given. Once we were all assembled, and after a number of people got a chance to cast the new Nissin Zerosum Oni Tenkara Honryu 4.5m rod (which I'll have in stock as soon as I can get them), we all headed out to fish. 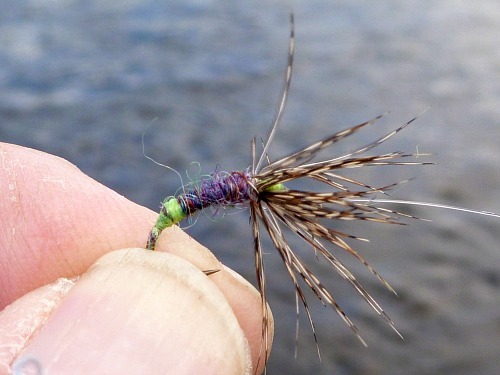 I had made up some Gravedigger No Vise mini fly tying kits, which John Vetterli handed out at the lunch break on the first day to anyone who wanted one. 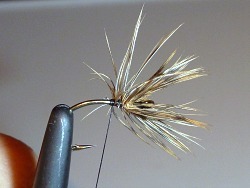 I don't know if anyone else tied the fly and used it, but I did and caught fish with it. 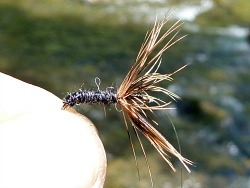 The Tenkara Guides swear by the Gravedigger pattern, although I suspect theirs are a bit prettier than mine was. 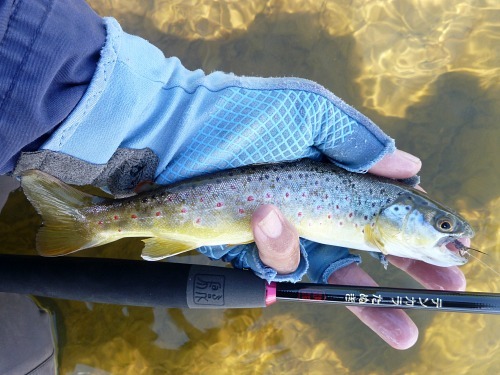 On the third day I got a chance to fish with one of Luong Tam's "Tanuki" tenkara rods. Nice rod! He had a number of different rods there that a few people tried, but I think this one is the "production" model and the others were prototypes. Lunch was brats 'n' beer. (The Tenkara Guides didn't serve beer, but some forward thinking - and generous - students had brought enough to share). How can you go wrong with brats 'n' beer? I don't think John Vetterli, above, got a chance to fish at all during the entire three day school. I think he was the maitre d', head chef, master of ceremonies, chauffeur and head of logistics for the whole event. I'm sure ERiK and Rob were just as involved, but John was the one who fed us. 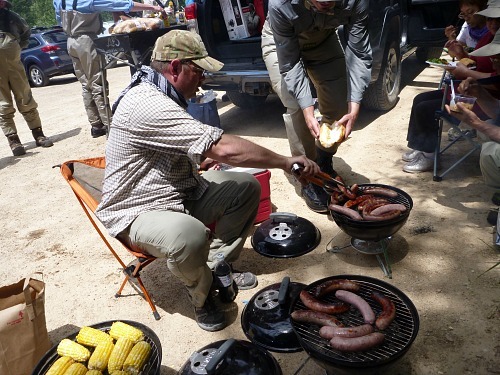 One thing is sure, if you go on a Tenkara Guides trip, you will be well fed! As we headed out after lunch, the clouds were ominous. 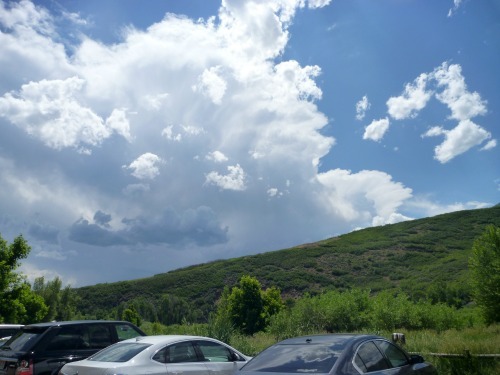 Later in the afternoon, the clouds developed into thunderheads. The group I was with stopped fishing at the first hint of thunder and got back to the cars just before it rained and then hailed. As someone who almost always fishes upstream, and who almost never fishes wide open "featureless" rivers, I was a bit surprised when Oni chose this spot to fish, which was not at all what I think of as ideal tenkara water. He fished downstream, and although he was far enough away that we couldn't see his fly, there was enough current that it was almost certainly skating on the surface. There appeared to be a very slight current differential (and possibly a different bottom) between what shows as slightly lighter and slightly darker water in the photo. I don't recall that he pulsed the fly much - perhaps some but certainly not all the time. He then moved a bit upstream and used the same strategy, holding his fly over what appeared to be a slight current differential or change in the bottom structure. Whatever it was, it was subtle. It worked, though, as he drew several strikes. Most of the fish either missed the fly or ejected it before he could react. Not all, though. He did hook one and immediately lowered the rod to horizontal, just above the surface. With lots of gestures and not many words, I asked him later why he had held the rod low like that. He replied, entirely with gestures, that had he held the rod high the fish would flop on the surface and quite possibly get away. I'd had a chance to fish with Oni briefly on my first trip to Japan. The primary thing I learned from that session was the importance of getting into the right position so that your first cast achieves the drift that you want. More than once he indicated that I should not cast to a likely looking spot from where I was standing, but instead from a different spot that he indicated, one from which the drift would be better. 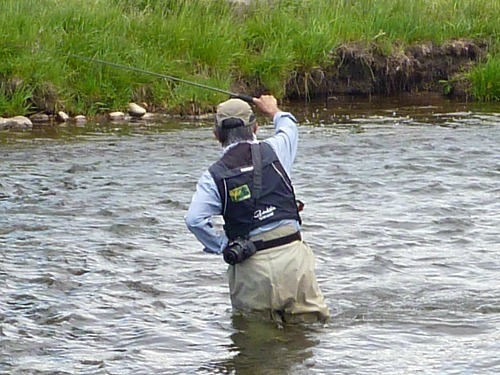 He doesn't just methodically wade upstream, casting to any likely looking spot. Many of his casts are across or even downstream. Watching him fish that last afternoon opened up a lot of water that truly, beforehand I would have just walked past. I tend to fish structure - rocks, logs, eddy lines, obvious current differentials. On that last afternoon the places he fished were much more subtle, and the entire afternoon he fished downstream, which I almost never do. The biggest revelation from the Oni School, though, was the few minutes of "hands on" casting with Oni. I have to say that as much as I have watched videos of his casting, I had misinterpreted what he does. 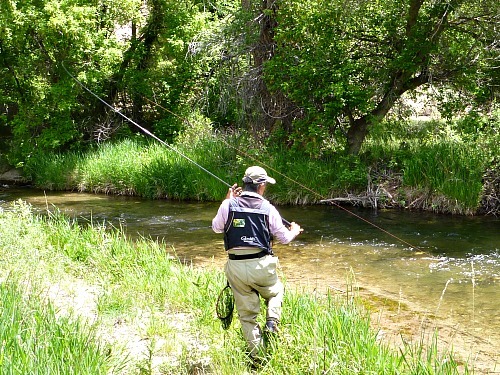 I had always thought that a tenkara cast was very "wristy," starting with raising the forearm and then bending the wrist. I was wrong. 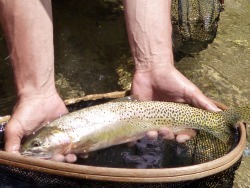 Much of what I have written about tenkara casting was wrong. 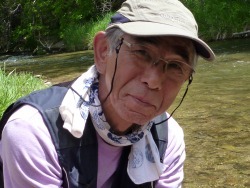 Much of what anyone has written about tenkara casting - at least in English, was wrong. 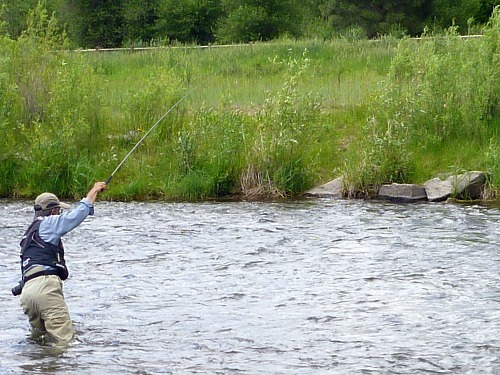 When I was casting and he then held the rod and my hand and cast with me, he had to tell me several times, "less wrist." The wrist is not locked and immobile, to be sure, but there is a lot more shoulder and a lot less wrist than I had thought. Before I write much more about casting, I will have to do a lot of practicing to make sure I fully understand what I should be doing. And of course, it's not just the motion of your arm and of the rod, it's also timing. Until you get the timing down, watching your back cast will improve your forward cast - at least it did with mine when Oni was watching and critiquing my cast. It is a question of not only how but also when you apply power on the forward stroke. I do believe there will be more Oni Schools in the US. If you get a chance to go to one, go. The cost is not insubstantial, considering the class itself (and I'll bet the entire tuition went to provide air fare and lodging for Oni and his wife, and for the excellent food we all consumed during the school), your own airfare if necessary, lodging, meals and incidentals. Consider this, though, how often do you get to go fishing, and what would it be worth for your fishing to be more productive and more enjoyable? If you read water better (not just to figure out where the fish are likely to be, but also to figure out how your fly and line are likely to drift), position yourself better, cast better and fight the fish better, your trips will almost certainly be better - and more enjoyable. And isn't that what it's all about?